The Urivi Vikram Charitable Trust—a National NGO, working towards the adolescent and women issues organized a Self Defense course at its Tagore Garden Center commencing from 8th July to 17th July, 2013 in the wake of women against atrocities and growing threat to young girls, who are out for their studies or career concerns. 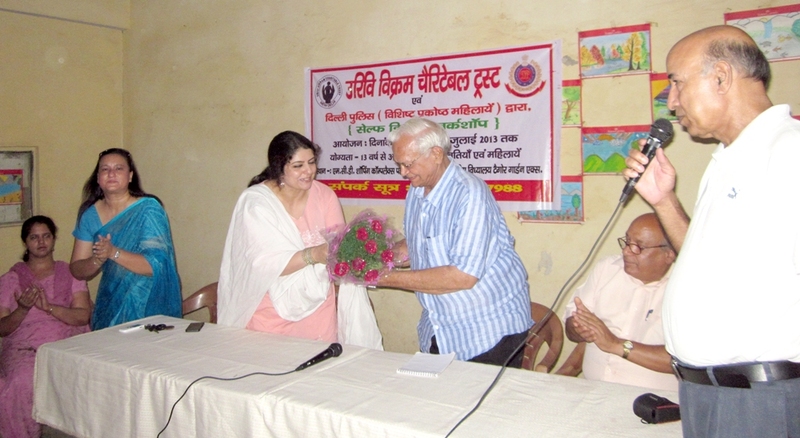 The Self Defense Course was inaugurated by Shri O.P.Babbar, Ex-M.L.A. and a renowned personality in Tagore Garden area, who was also awarded the best M.L.A. Award a few years back. Smt. Manorama Bakhshi, CEO welcomed the Chief Guest Mr. Babbar and mentioned how the girls could fight the gunda elements and save themselves from harassment. She urged the girls to be brave and bold against all chances of gundaism. She advised the girls to use police helpline for women recently introduced by the administration. Speaking on the recent unrest in the Capital, Shri Deepak Bharatwal, Director (Admin. ), UVCT advised the girls to remain disciplined and avoid confrontation with bad elements as “God helps those, who help themselves”. He also advised the girls to move in groups to counter any attack or attempt of threat to their modesty. Shri Deepak Bharatwal also recalled the contribution of Shri Babbar and wished his support will continue for social cause to the Trust. Shri O.P.Babbar thanked the UVCT Team for organizing such a Course and assured that he will support the Trust for all its good steps. He also recalled his long association with Dr. U.N.B.Rao, IPS, when he was Joint Commissioner (Police). Mrs. Manisha Jethwani and Ms. Ritu Singh registered all the participants and requested them to bring in more and more girls and women. The course will continue for 10 days at Tagore Garden Center of Urivi Vikram Charitable Trust, free of charge, with the help of Police Authorities. Shri B.S.Negi, Treasurer extended vote of thanks to the Chief Guest and the participants. The students showcased their perceptions about “Swachh Bharat” through their creativity over canvas.